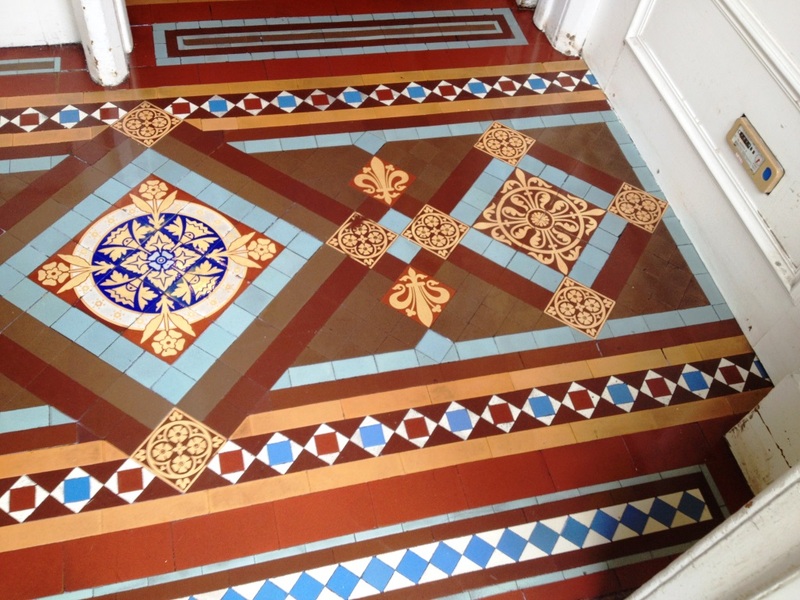 Victorian tiled floors were popularised during the 19th century and continue to be in fashion to this day. However they do need to be properly maintained and many homeowners need assistance with this as was the case with this customer in Edinburgh. 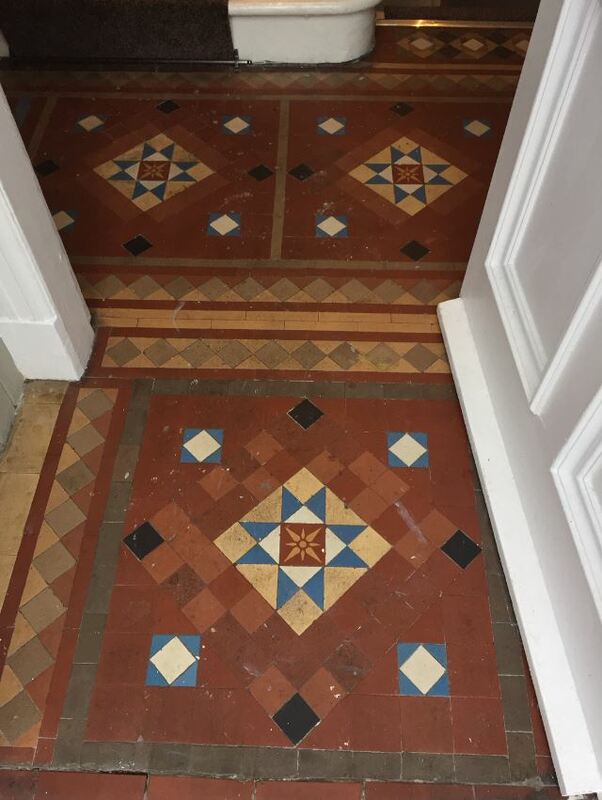 Their Victorian tiled hallway floor was very dull due to several layers of ingrained dirt, and was also marked in numerous places by paint splashes from decorating. The customer was unable to deal with these issues themselves, despite trying several times with everyday cleaning products and called us in to restore the floor back to looking its best. To begin, I mixed a 50:50 solution of Tile Doctor Pro Clean and Tile Doctor Remove & Go which creates a powerful cleaner/stripper solution. Pro-Clean is a high alkaline cleaner, while Remove & Go is specifically designed to break down adhesives, paints and any old surface sealer. The solution was sprayed onto the tiled floor and left it to dwell for 5-10 minutes. It was then thoroughly scrubbed into the floor, and any excess residue was promptly extracted using a wet-vac machine. The area was too tight to allow for a heavy rotary machine fitted with a scrubbing pad, so I opted to complete the cleaning process by hand. To ensure a high quality clean in lieu of the absent rotary machine, I scrubbed the floor three times over, successfully removing all of the paint marks and ingrained dirt in the process. After cleaning it was important to neutralise any excess chemicals left over on the tiles, and I did this by washing the entire floor with Tile Doctor Neutral Tile Cleaner. A wet vacuum was used to remove as much moisture from the floor as possible and then it was left to dry fully overnight. 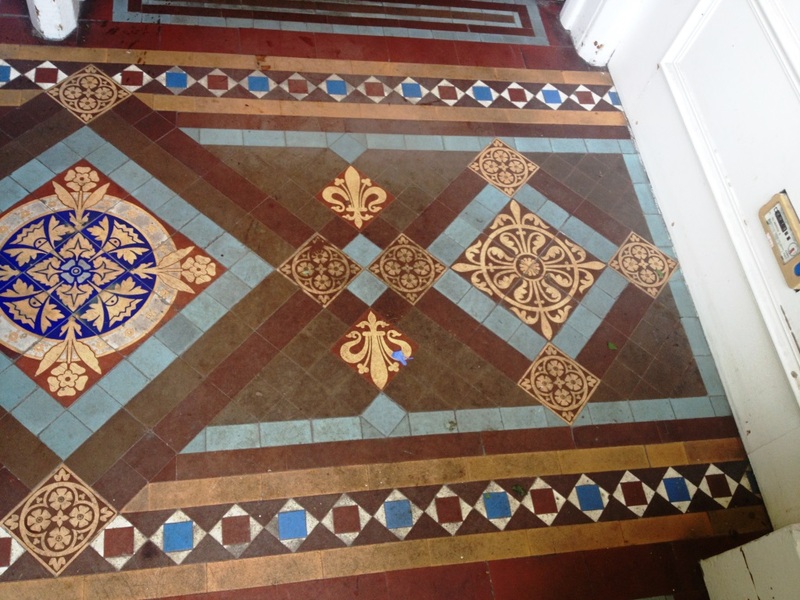 On the second day, I returned to the house to seal the newly cleaned Victorian tiles. The customer specifically requested a natural, non-sheen finish for the surface seal; now normally I recommend Seal and Go for Victorian tiles however it does leave a shiny finish and so I switched to Tile Doctor Colour Grow which is an impregnating sealer that met the client’s requirements and has the additional benefit of improving the natural shades and colours within the tile. 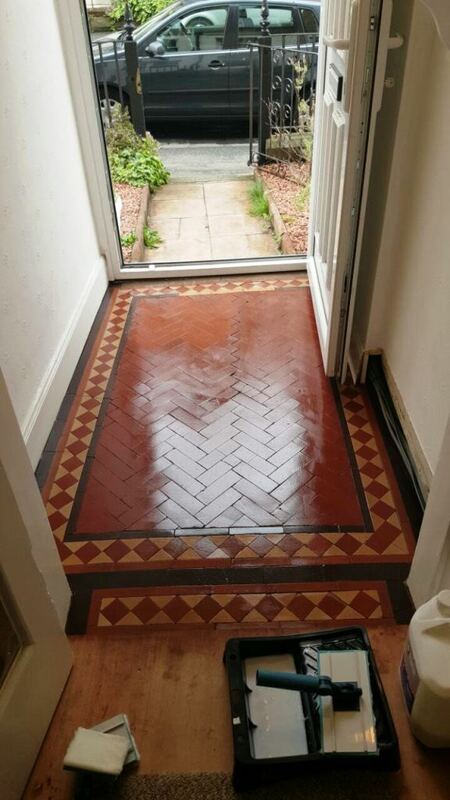 Three coats were applied to fully protect the tiles allowing the floor to dry between each coat. My customer was very happy with the results achieved over the course of two days. Before leaving the property I made sure to impart some advice on cleaning products and methods, to help the customer take long-term care of this fantastic Victorian floor. This job was at house in Polwarth, a small parish through which flows the Union Canal, running from Falkirk to Edinburgh. 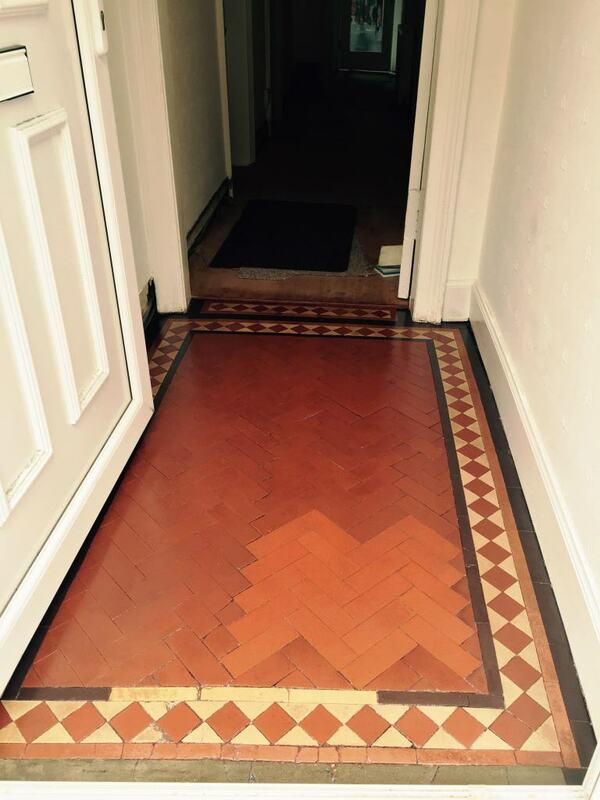 The client had requested a clean for a Victorian tiled hallway set in the narrow reception area of the house. 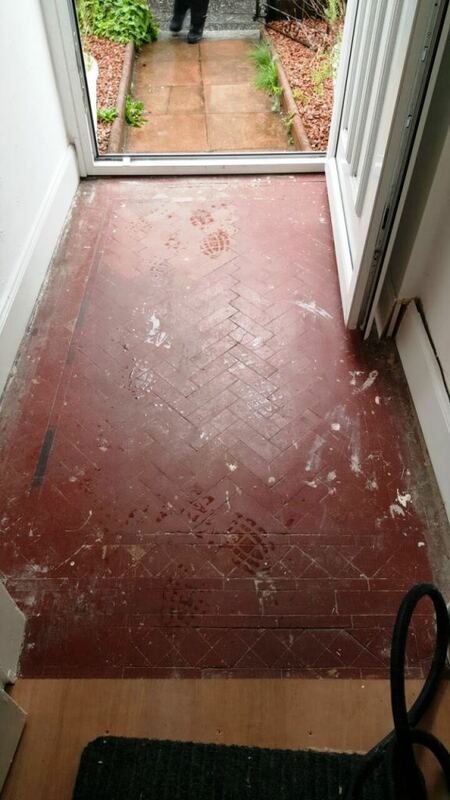 The tiled floor had been painted over by the previous owners of the house using a thick, red paint. Painting a tile floor in such a way can affect its wash-ability, and the paint can peel off over time especially in a high-traffic area such as a reception area or hallway such as this. 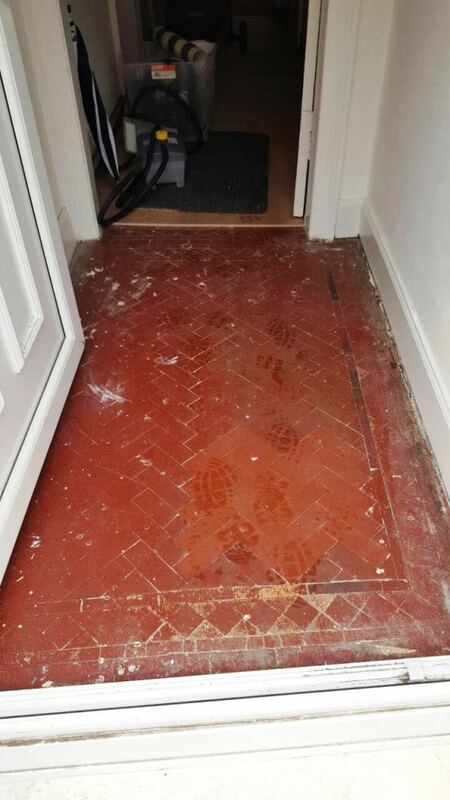 The red paint would have to be removed in order to restore the tile underneath and reveal its natural state, as well as provide a thorough and much-needed clean. The first step in the paint removal process was to spray the floor with a strong solution of Tile Doctor Pro-Clean mixed with Remove & Go. Pro-Clean is a heavy duty cleaner and degreaser, suitable for use on tile, stone and grout. Pro-Clean combines well with Remove and Go, which is a multi-purpose stripper capable of removing most sealers, adhesives and, particularly important for this case, paint. The solution was left to dwell after application to allow it to soak into the tile and soften the paint and dirt. After 10 to 15 minutes we scrubbed the floor in order to remove as much of the paint as possible. 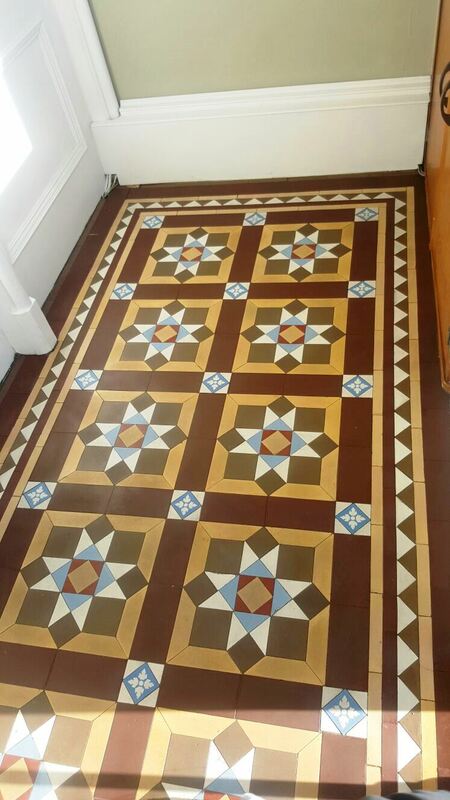 The owner of the house was surprised to see the true colours of the tile appearing, which had been hidden beneath the paint for a significant period of time. As the red paint coating was particularly thick, we had to scrub the floor multiple times. In some areas the paint proved tricky to remove so it was necessary to use a steamer to steam clean the stubborn areas. Once all of the paint had been successfully removed, the unveiled tile floor was treated to another clean using Pro-Clean, before being given a wash down and neutralised using Concentrated Neutral Tile & Stone Cleaner. It’s important to ensure any trace of strong cleaning products are removed from floor before the next step of sealing as it can impact the sealer leading to un-even results. 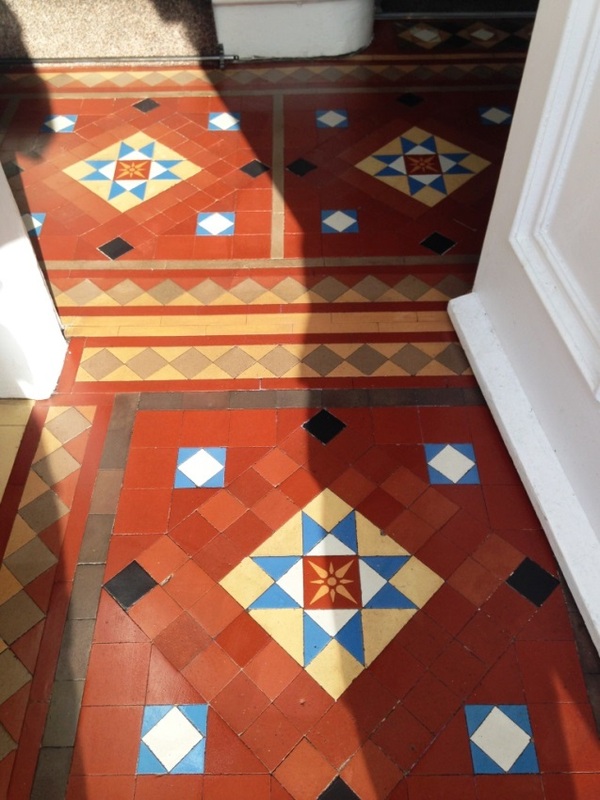 The floor was left to dry off overnight and we came back the next day to seal the tiles using four coats of Tile Doctor Seal & Go which is an ideal sealer for Victorian tiles as it provides stain protection whilst also bringing out the colours resulting in a subtle sheen appearance. You can see from the photos that after a thorough cleaning and sealing the floor was back to looking its best. 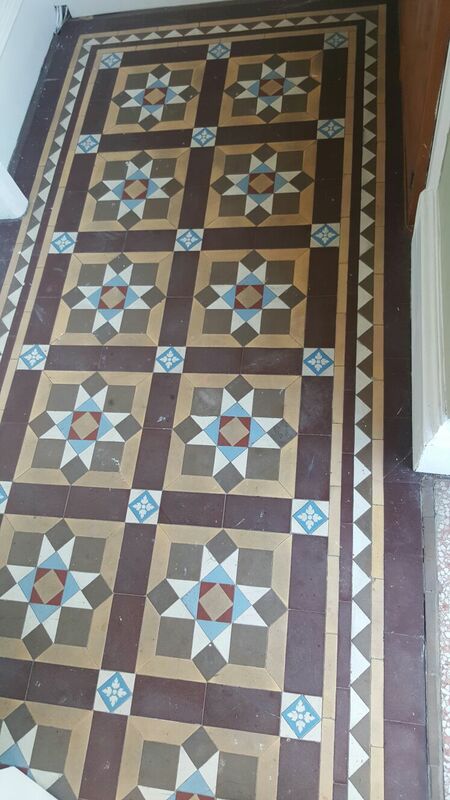 I do wonder why someone would want to paint over such a fantastic Victorian tiled floor!